For the year 2015, firstly Samsung Galaxy S6 and S6 Edge were the most awaiting and now other two phones are about to rise in the market. Yes we are talking about Samsung Galaxy Note 5 and Galaxy S6 Edge Plus. And both phones would be best phablet launched till date. Also, as you must be aware that Samsung is continuously bringing the changes to its Galaxy Note and S line up, for example the Galaxy S6 completely changes the way Samsung was following in design and materials, especially with the amazing version Edge, a smartphone with curved display by side, the first thing we see with these characteristics. We are facing a smartphone on the outside mainly composed of three parts, the front panel and the rear, both covered with Gorilla Glass 4, and a metal side frame. The front is in the most amazing, with the curvature on both sides that give a different look as innovative and Edge. Besides, here we find the classic home button Samsung, two capacitive buttons for multitasking and behind the camera and proximity sensors and light. 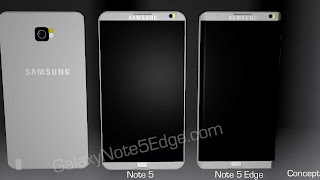 Same configuration with bigger size would be the part of Samsung Galaxy Note 5. As appeared in the Galaxy S6, the rear we have 16 MP Camera, flash and the heart rate monitor. The back has been treated with a material that reflects light and creates very attractive colored effects, giving a further premium to the device. In early versions we could see this layer was exaggerated, creating reflection effects and changes color depending on the light, but that together they had not received final oleophobic layer made much stains and fingers. The final version is not as striking, but is much less suffering and better conceal all those spots that were so annoying. The appeal of the rear is especially the color change that makes going from black to blue as light and from where we look, or dark green to turquoise green pattern, for example. It is these details that make so beautiful the Samsung Galaxy S6. And hence Samsung Galaxy Note 5 would be beautiful as well, but Samsung should work on the design such that there won’t be any marks of fingerprints. It is in this back where we find one of the few design problems in Samsung Galaxy S6. The camera stands, and although it is inevitable due to the thickness of the smartphone is slightly annoying. Samsung has solved quite well making the frame out slightly, so that the terminal support never touches the lens. Yet it is more likely that this is scratched. Also it ends up being a problem to have a phone with all the rear glass, which is that this finish has a habit of skating on any surface. We have not had as many problems as with the Nexus 4, but it is true that you have to walk with eye not leave it in a smooth sloping surface, because it will not hold fixed. 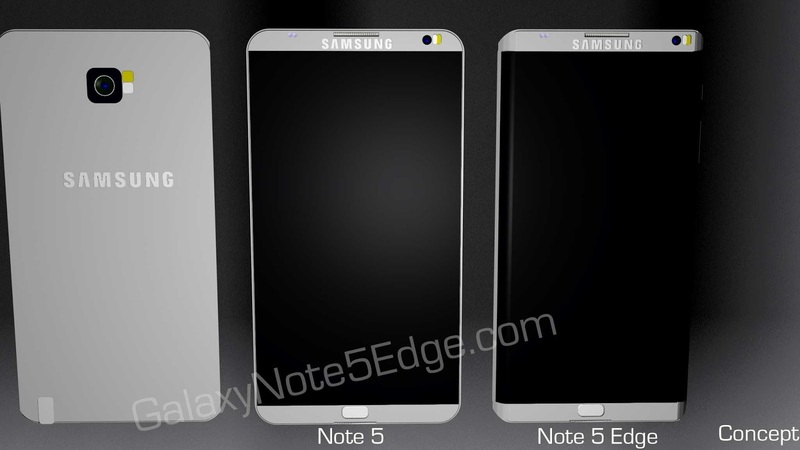 And here we have all new Samsung Galaxy Note 5, that would just appear in the market.